The Rajasthan architecture significantly depended on the Rajput architecture school which was a mixture of the Mughal and the Hindu structural design. Grand Havellis, astonishing forts and elaborately carved temples constitute the vital portions of a architectural heritage of Rajasthan. The Rajputs carries the credit of creative builders. Few of most striking and splendid forts along the with places with parched Aravali land clearly depicts the history of Rajasthan’s celebrated heritage. • Rajasthan architecture arouses from the Rajput school of architecture, a perfect mixture of Hindu and Mughal structural pattern. • The State of Rajasthan hosts a few of the splendid palaces and forts of the whole world. Ornamented havelis, elaborately carved temples and also magnificent forts are a section of the Rajasthan’s architectural heritage. • The artistic builders of the Rajputs designed major architectural styles which are located in cities like Jaisalmer, Udaipur, Jaipur and Jodhpur. • The most significant architectural designs in Rajasthan include Jantar Mantar, Dilwara Temples, Lake Palace Hotel, Chittorgarh fort and Jaisalmer Havelis. The Dilwara Temples have been described as a dream in marble. Mount Abu, A popular hill station, located in Rajasthan is on the Ahmadabad, Jaipur and New Delhi railroad, Off the Abu road, the nearest railhead. Other attractions here include the Nakki Lake, The Adhar devi Temple, The Achalgarh Shiva Temple and the Gau Mukh shiva Temple. It was built in the Nagara style and is among the finest monuments of India. The first of these ornate temples dates back to 1032 CE, approximately the period in which the Grand Brihadeeswara temple at Thanjavur in Tamil Nadu (south India) was built in the Dravidian Style of Architecture. This is the earliest and the most important of the temples here and is dedicated to the first Jaina Tirthankara, Adi Nath. It stands in an open courtyard defined by 58 subordinate cells which contain small icons duplicating the saint’s image in the main shrine. The plan of the temple resembles that of the Kashmiri Sun Temple at Martand. Elaborately columned porticoes surround the main shrine and front the cells lining the courtyard. The entire temple is carved out of white marble. 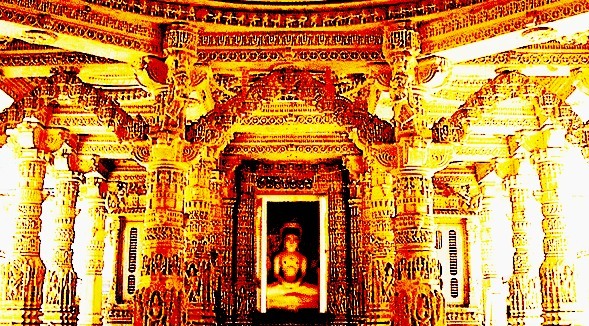 It although resembles the architectural plan of the Vimala Vashi temple, (built nearly 200 years earlier), It nevertheless stands as the last of the monuments built in the Solanki style, which came to an end with the occupation of Gujarat by the Muslims towards the end of 13th century. 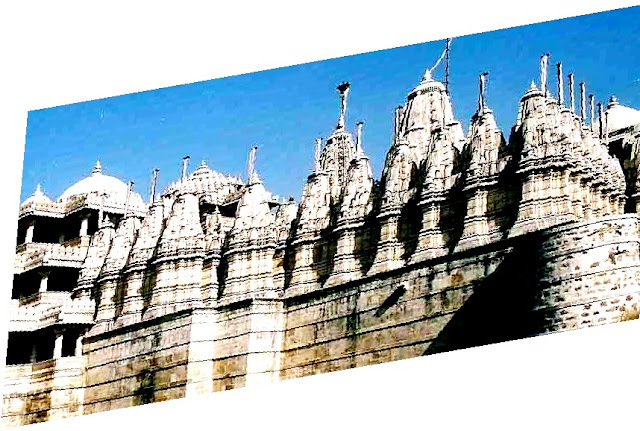 The striking feature of the Tejapala temple is its dome which stands on 8 pillars. The pendant of the dome is a perfect gem; where it drops from the ceiling it looks like a cluster of half open lotuses.